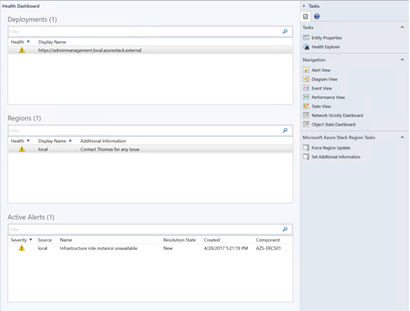 With this blog post we announce the availability of the technical preview of the Microsoft Azure Stack Management Pack for System Center Operations Manager. Microsoft System Center is a powerful management tool for the datacenter. Microsoft Azure Stack is a new hybrid cloud platform that allows you to run Microsoft Azure services in your datacenter. Azure Stack integrated systems will be a part of the larger assets customers have in their datacenters, so it is vital that there is an integration that facilitates aggregate management via System Center for Azure Stack. This management pack enables System Center Operations Manager 2012 R2 & 2016 to monitor Azure Stack. In addition to alert management, Operations Manager expands Azure Stack with capabilities like sending notifications via different channels or scheduling maintenance windows during an update run. 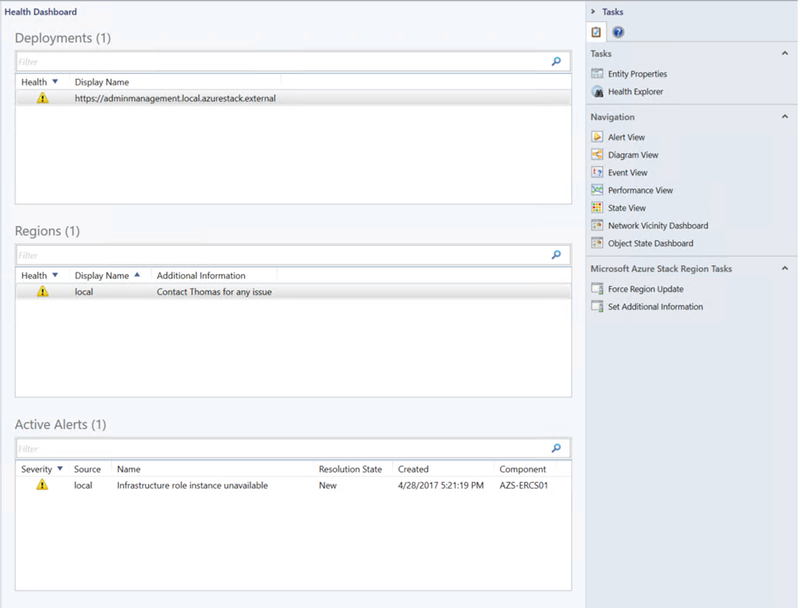 Once alerts are received in the Operations Manager, existing connections within the Operations Manager to other products, such as Service Manager, can be leveraged. For example, this product can be leveraged to create a service ticket. This management pack allows you to integrate Microsoft Azure Stack with your existing IT Lifecyle by leveraging already existing processes and workflows. The Health dashboard allows to view and drill into the health of multiple deployments of Azure Stack including multiple Azure Stack Regions, once available. For customers not using Microsoft System Center Operations Manager, we also released a Nagios monitoring plugin with similar capabilities in partnership with Cloudbase. This plugin is written in python and leverages Azure Stack Health Resource Rest API. The same rest API is used by Azure Stack’s own Portal, PowerShell, and of course the Azure Stack Management Pack. Please provide feedback by using the Azure Stack Forum. If you have a feature request that we should consider please use Azure Stack User Voice.